Who doesn’t want beautiful glowing skin? As a registered dietitian, I feel paying attention to eating a whole-food based, Mediterranean-style diet and drinking half your ideal body weight in fluids is the best way to make sure you’re eating a healthy skin diet. If you are eating a healthy diet and acne persists, there are a number of specific skin treatments to treat acne and give a boost of glowing good health to your skin. This is an aggressive acne treatment routine that I developed for my son who has severe acne. I am not a dermatologist but my strong science and chemistry background and interest in proven ingredients in skin care products has led me to do extensive scientific research on evidence-based ingredients in skin care products. The ingredients I have selected for this acne treatment consist of well-researched acne-fighting ingredients: salicylic acid, benzoyl peroxide, glycolic acid and retinol. In addition, I have researched the best, high-rated products for the money and have links to them within this article so that you can duplicate the routine. Salicylic acid is a beta hydroxy acid (BHA) that helps skin to shed dead skin cells from the surface of the skin and inside the pores helping to keep the pores clear. BHA is best ingredient choice for blackheads and acne or enlarged pores. It also has antimicrobial properties. Benzoyl peroxide kills bacteria and also helps unclog pores. Benzoyl Peroxide helps boost the acne-fighting results of salicylic acid. Glycolic Acid is an alpha hydroxy acid (AHA) that exfoliates the surface of skin and causes the top later of the skin to peel. 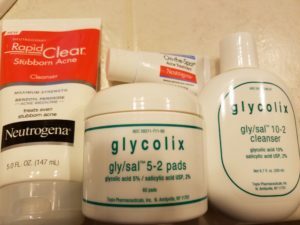 You must use a sunscreen if you are using glycolic acid. Retin-A is a prescription product and retinol can be found over the counter. Both help to unclog pores. Clogged pores lead to a pimple since bacteria thrive and multiply in clogged pores. Sunscreen MUST be applied liberally when using a Retin-A or retinol product. I recommend a sunscreen containing the mineral zinc oxide since it acts as a physical block to the sun’s rays. Zinc oxide used alone at high concentrations or combined with the chemical sunscreen ingredient octinoxate works very uniquely with the zinc oxide and is the best broad spectrum sun protection. This sunscreen is my favorite. Do not use sunscreen products that contain Oxybenzone. The Environmental Working Group has rated oxybenzone an 8 on their toxicity rating scale, meaning it is one of the most toxic ingredients found in cosmetic products. The EWG and other toxicology experts are concerned about the compound because it has been linked to hormone disruption and has the potential to damage cells that may lead to skin cancer. 1. Wash your hands and dry with a clean towel. Everything that touches your face including your hands and towels must be clean and bacteria free. 2. Wash with Benzoyl Peroxide Acne Treatment Cleanser 10% and dry with a clean towel. 3. Swab the skin with 2% Glycolic Acid and 2% Salicylic Acid Acne Treatment Pads. Wait until it air-dries. 4. Apply a thin layer of Benzoyl Peroxide Acne Treatment Cream 2.5%-5%. Carefully avoid the delicate area around the eyes. Do not rub. Just allow your fingers to glide over your skin, spreading it around and letting it absorb on its own. 5. Apply additional medications, an oil-free sunscreen, a moisturizer or makeup after the cream has dried. 6. Sunscreen MUST be applied liberally when using a Glycolic Acid product. 2. Wash with 2% Glycolic Acid/2% Salicylic Acid Cleanser and dry with a clean towel. 3. Swab the skin with 2% Glycolic Acid and 2% Salicylic Acid Acne Treatment Pads and wait until it air-dries. 4. Apply a thin layer of a Retin-A or Retinol Cream. Carefully avoid the delicate area around the eyes. Do not rub. Just allow your fingers to glide over your skin, spreading it around and letting it absorb on its own. 5. After putting on Retin-A or Retinol Cream wait 15 minutes before moisturizer to let it absorb. 6. Apply additional medications, an oil-free sunscreen, a moisturizer or makeup after the cream has dried. Exfoliate gently every other day to remove built-up dead skin cells, revealing new skin. You may use a clean Buf-puf or Clarisonic at night when you wash with the cleanser. Make sure you keep these clean and that they dry out between uses since they can harbor germs. It is normal for the skin to become flaky and somewhat dry due to the irritation of the medicated products. This regimen can be irritating to the skin. If irritation develops, discontinue use and contact a physician. Discontinue the routine and only use a mild cleanser to wash and apply an oil-free moisturizer. Once your skin has returned to normal, use the mild cleanser, pads and cream (steps 2, 3 and 4) only once every other day and use the mild soap and moisturizer the other times you cleanse. If no dryness develops, increase to once a day for steps 2, 3 and 4. If your skin remains free from dryness, you can go back to the routine twice a day. If it ever becomes dry, go through this process again until it normalizes, then resume again. The pads are the most drying. You may be able to tolerate the pads in your tough oily areas of the forehead and around the nose and mid chin.